One of the really wonderful things about being back in Japan is the feeling of infinite possibilities. Especially when I’m in Okinawa, I feel like if I had ten lifetimes, I could research and write about such an incredible variety of topics. Really explore a diversity of aspects of Okinawan history and culture. Not to mention trying out countless cafes and restaurants, going to shows, getting to know performers/scholars/activists, etc. Back in Naha for the first time after living (nearby) there for six months, and I just kept thinking, I love this town. Part of it, I think, is just the self-reinforcement of how familiar it’s become. The more you get to know a place, the closer you get to it emotionally, just from familiarity. But I think a lot of it also just has to do with the city itself. I love the feel, the culture, the food. Of course sometimes it’s brutally hot out but even then, much like in Hawaiʻi, the sun just makes everything so beautiful. The colors pop, the sky is so blue and those buildings and whatever that are white are so white, and when there’s a breeze, or even when there isn’t, it just feels so open and airy. Maybe that’s just the difference of coming to Naha from Tokyo and NY – anywhere is going to feel open and airy compared to the “canyons” of Manhattan. The view of Kokusai-dôri in Naha from my guesthouse, AbestCube Naha. Coming back to “mainland” Japan from Okinawa, I always feel the cultural difference pretty strongly. It’s not a difference like one would get culture shock, like going from the US to Japan or the US to England or something like that. But, just that Japanese food and Japanese traditional architecture and certain other things like that are, basically, foreign in Okinawa, or at least they’re a minority cultural presence. When you go to a “Japanese restaurant” in Okinawa, it stands out, it feels like you’ve entered a different space, much like for example a Japanese restaurant in the US. You’ve stepped out of Okinawan cultural space into Japanese space, where the food is different, the aesthetics are different…. And, one does get a sense or a feeling that this is the culture that conquered and annexed and sought to assimilate Okinawa. I don’t mean that in an overly political, fist-shaking, crying for revolution, kind of way; I don’t mean it in an anti-Japanese kind of way; but just that I do get a little bit of a sense of that. And it is tied into a certain ignorance – which, again, I don’t mean in an overly political way, but just that it’s interesting to go from somewhere where the tension between Okinawanness and Japaneseness is ever-present, to somewhere where there is (more or less) only Japaneseness, and thus no tension – whether in Tokyo or in Kagoshima, Okinawa is just not at all on the forefront of the vast majority of people’s attention, just as Hawaii or Guam or Okinawa for that matter are not at the forefront of people’s attention or awareness in LA or DC or NY. 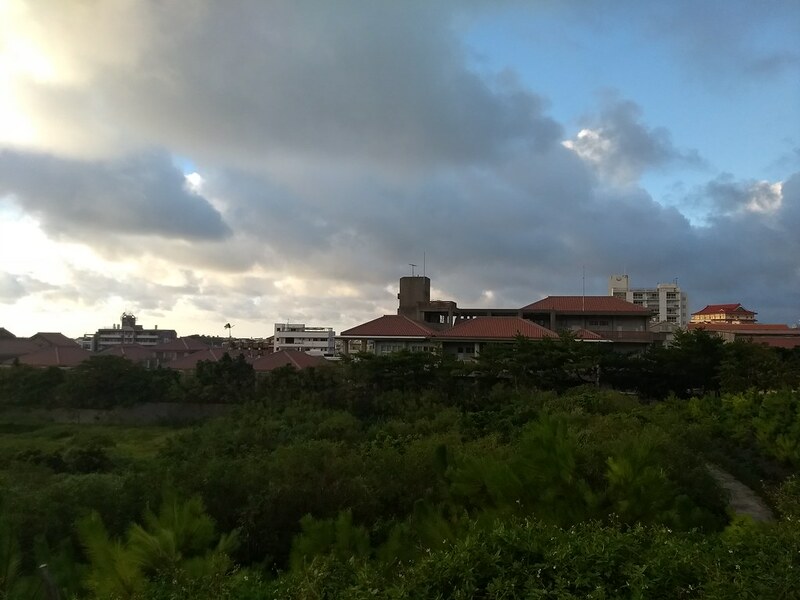 Okinawa University of the Arts as seen from Shuri castle. In any case, on a separate subject, for my first few nights in Kagoshima I was staying in a real proper hotel for the first time on this trip, and was seriously wondering why. I got it for quite cheap, if I remember correctly, so that’s good. But, honestly, I stayed with my dad in a motel on the side of the highway in middle-of-nowhere New Jersey, and the place was nicer than this. I guess I should have expected it – I’ve stayed in enough Japanese hotels in my life. But it’s just funny, it’s weird, you know? Here I am, moving from what’s ostensibly a lower-class of establishment, hostels and cabin hotels, youth backpackers’ sorts of places which are kind of, in a certain sense, on the margins of the hotel industry (insofar as they are not the big chains which dominate the industry). 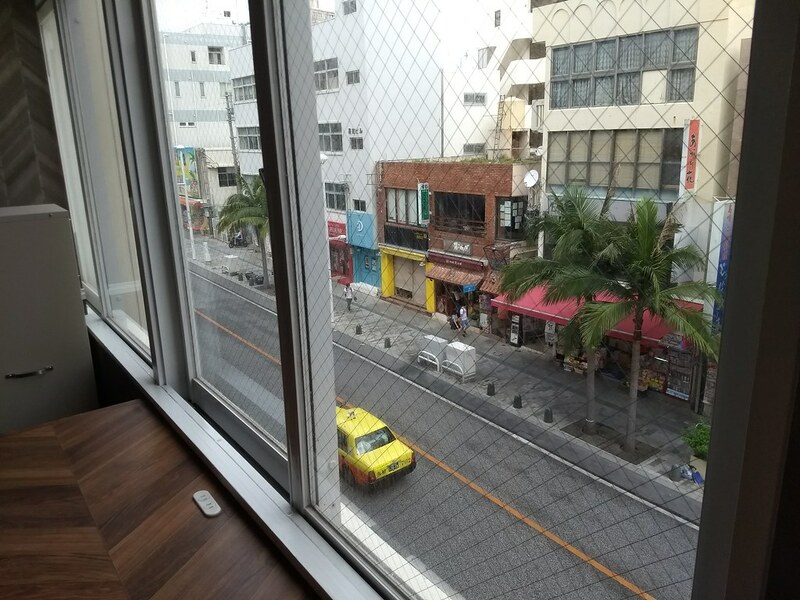 And yet, both the &AND HOSTEL AKIHABARA that I stayed in for a few nights at the beginning of my trip, and the Abest Cube Kokusai-dori place where I stayed in Naha, had a much brighter, cleaner, nicer, newer aesthetic, and, really, in a certain sense, better facilities. I mean, having your own private bathroom should of course count as a plus over having a shared bathroom down the hall. But, actually, I just really don’t like these tiny in-suite box bathrooms. 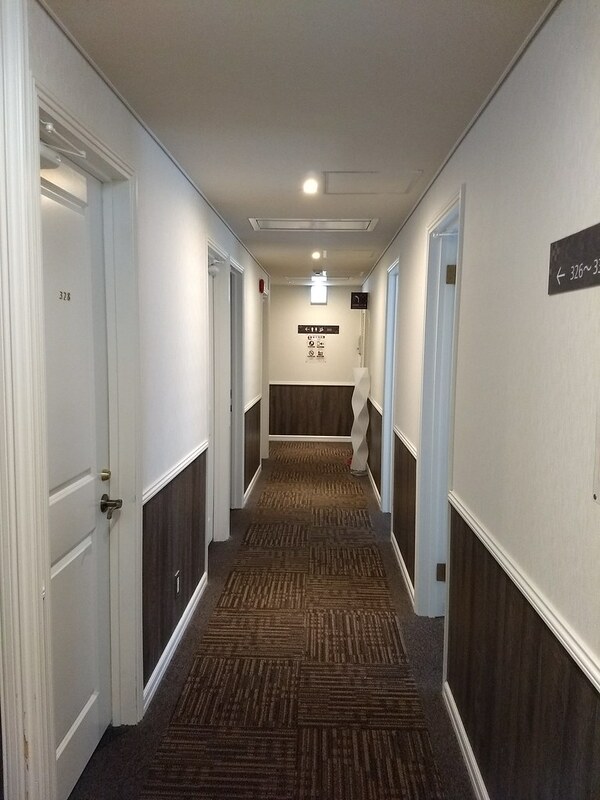 The hotel room itself is so small that you’re literally sleeping just two or three feet away from the bathroom door, just two or three feet away from the toilet, albeit with a wall in between. And it’s just gross. Plus, these box bathrooms always feel cramped, and quite often you have to switch over the water from the sink to the shower – I don’t know why that bothers me, but it does. It feels cheap, low quality, to me. And while the room, and the hotel overall, certainly look clean enough and don’t have an overtly run-down sort of feeling like so many hostels do, still, in comparison to the very bright, clean, white sort of aesthetic of the nicer, newer, hostels, I don’t understand why it seems so standard in mainstream hotels for everything to be brown / tan / cream. Not that I think it’s genuinely less clean, but it feels less clean. It feels darker, smaller, more closed-in. It lacks that sunny, airy, open feeling that you get at places like Abest Cube and &AND HOSTEL. Why do they do that? Halls at Abest Cube Naha. Sure, they’ve got some funny stuff, like how you can’t control your AC individually, and how they don’t want you talking on the phone in your room (because I guess the walls are too thin, and the noise carries?). But outside of those two things, I have absolutely no complaints at all about Abest Cube Kokusai-dori. Everything looks perfectly clean and sleek like it’s brand new. Not just recently cleaned, but honestly like-new perfect. There isn’t even the tiniest hint of the place being rundown or “discount” or lesser-than. It’s no glitzy five-star hotel, but who needs that honestly? The bathrooms and showers are perfectly clean. The water pressure and temperature in the showers is excellent. The beds are nothing super amazing (memory foam or anything) but they’re big, and more than comfortable enough. The common rooms are nice, and offer a nice view overlooking Kokusai-dori. The breakfast is small and basic, but it’s freshly made and it’s included. A slice of toast, half a hard boiled egg, a little salad, a little fruit, and a little soup. And I can hardly imagine a more convenient location. It was cool staying in the guesthouse in Tsuboya, and it would be cool to stay *in* Heiwa Dori as well, really immersed in a neighborhood like that. But this is really the next best thing. A couple minutes walk to the monorail, a few minutes in the opposite direction to the entrance to Heiwa Dori. Sure, Kokusai-dori is crazy touristy, in some respects it’s like staying in Times Square. But even so, it puts you right in the center of everything. And I managed to get a room – a private room, not a capsule or a dorm bed – for less than $30/night. *This* is the right way to do lodgings. I wish I could stay at Abest Cube all the time everywhere I go. 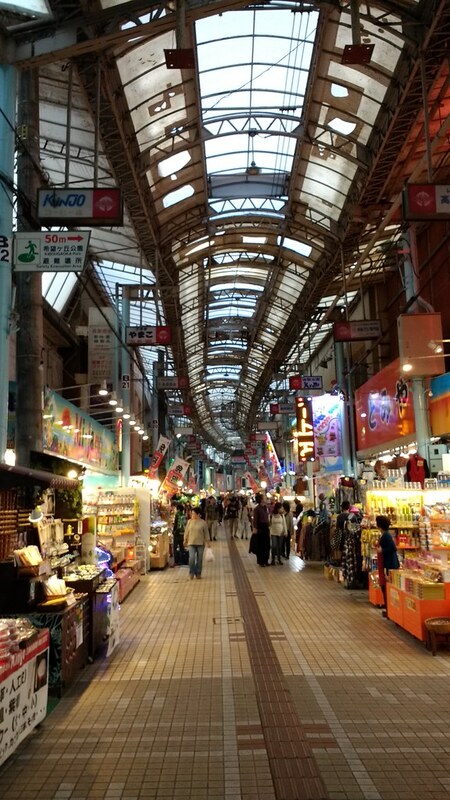 Right: Heiwa-dôri, a maze of a shopping arcade in central Naha. “Ryûkyûjin ôrai suji nigiwai no zu,” c. 1850, Uetsuki Gyôkei, detail. Section of a handscroll depicting the hubbub in the streets of Edo just after a Ryukyuan embassy procession passed through. Small, low-quality photo found online somewhere – no thanks to Kagoshima University Library, who refuse to make such images available at all. Turning to my time in Kagoshima, my sincere thanks to Hori-san at the Kagoshima University Library for allowing me to see two beautiful and one-of-a-kind paintings, even though the library’s website seems to suggest that as a basic policy they don’t generally show anyone the originals. No thanks to his institution’s policies, meanwhile, which do not allow researchers to take photographs, even with an application /permission form, and which insist we should satisfy ourselves with the rather poor, low quality digital images of which, even those, can only be viewed at the library and cannot be downloaded or otherwise copied to take home. I don’t know how anyone is supposed to do research like this. No thanks, too, to the Kagoshima Prefectural Library, which on multiple occasions has shown the most obnoxiously strict interpretations of copyright law I have ever seen. Even when other institutions explicitly say you can copy one whole article out of a journal so long as you’re not copying the whole journal, only at Kagoshima Prefectural Library would they consider an article one whole and expect that anyone should be okay with only copying parts of the whole. Seriously? 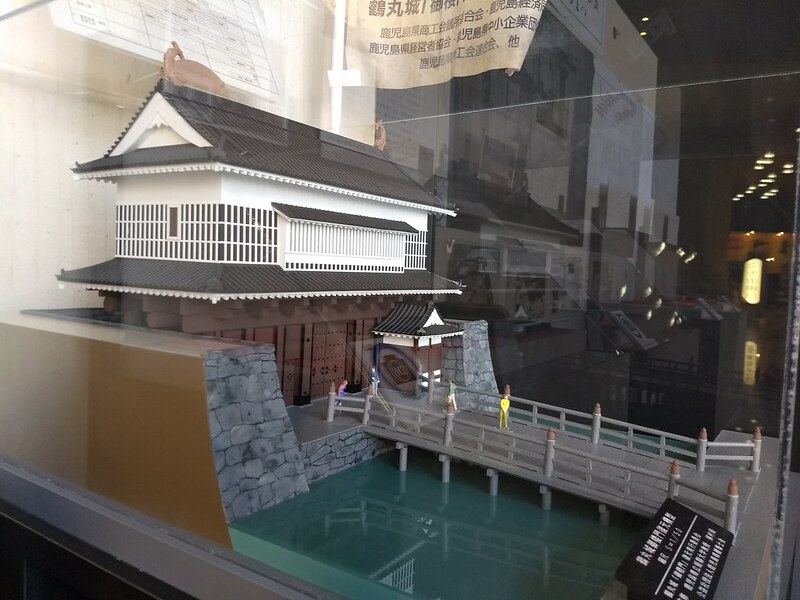 Above: Model of Kagoshima castle main gate, which apparently they’re planning to rebuild by 2020. 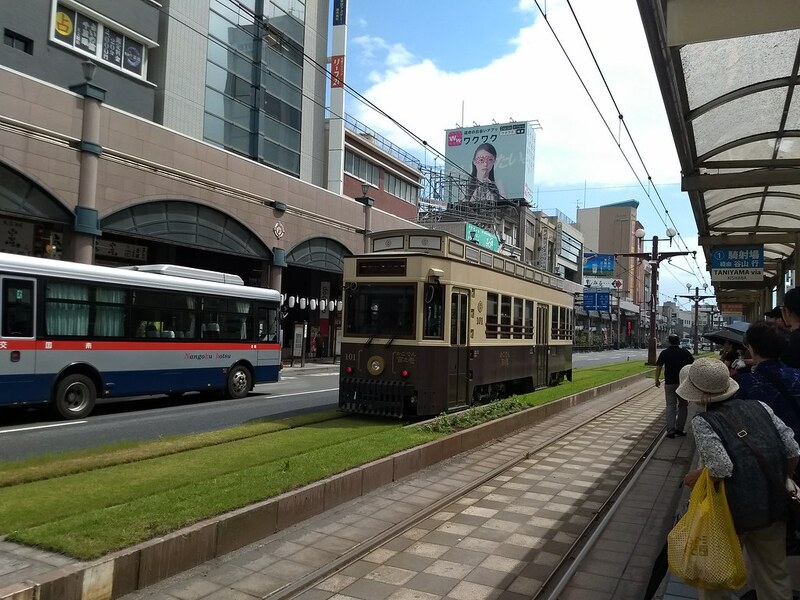 Below: A shiden electric streetcar passing through the Tenmonkan neighborhood of Kagoshima. All that said, though, Kagoshima is a city I could see living in. I don’t know anything about which institutions might ever hire me, but I guess thinking more along the lines of a several-month fellowship or something, I just like that it’s such a good size city. Tenmonkan is a great vibrant but cozy shôtengai neighborhood, and more or less everything else in the city is in either short walking distance or there are the shiden streetcars, which I love. There’s something about the Tenmonkan area that just makes me feel like it’s the classic model shôtengai. After a night or two in that crappy business hotel, I found a wonderful AirBnB right in the middle of the shôtengai. I was nothing too special, not fancy at all, but for less than $35/night I got to have an entire apartment to myself – small kitchen, private bath/shower, A/C, wifi, and (oddly) three beds in the one large bedroom. 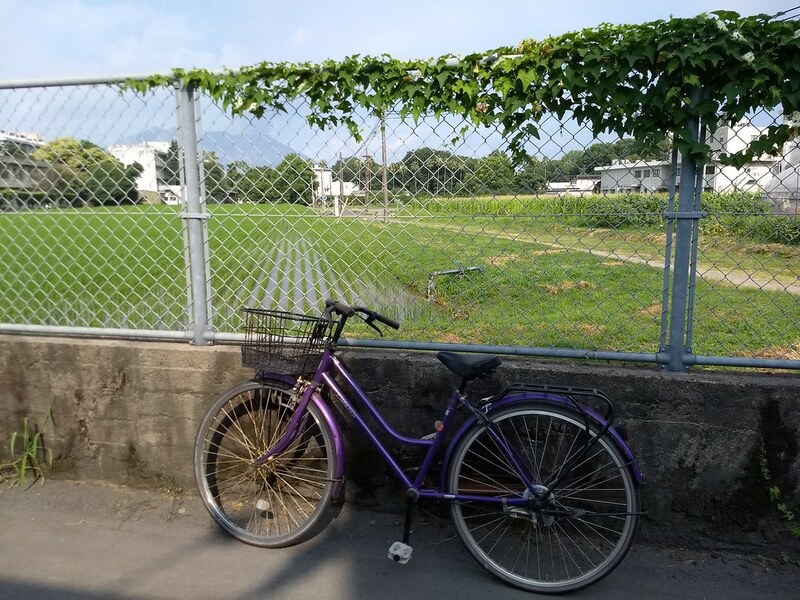 I don’t know when I personally will find myself looking to stay in Kagoshima with 2+ close friends as a whole traveling group, but if Take’s apartment is available, it would be an excellent place. And the shôtengai itself is nice, too. Not particularly touristy, not particularly hipstery/gentrified, but also not too run-down or out-of-date. Just, I dunno, normal. A good, decent, assortment of shops. I imagine that if I lived there more long-term, it could be a decent place to go shopping, to find favorite stores or bars or cafés… Not as exciting as Naha’s Heiwa-dôri, but, a nice taste of the “regular” (non-touristy) Japanese shopping street experience. 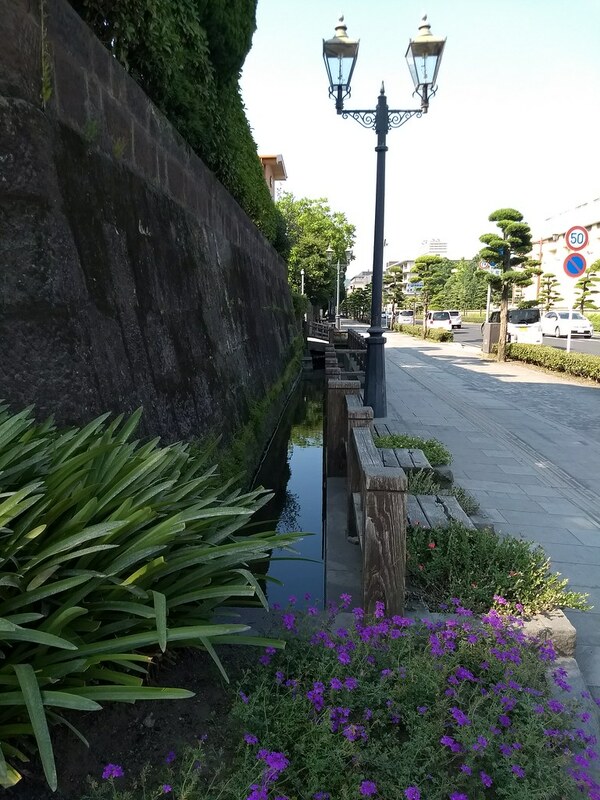 Outer walls of Kagoshima castle. All photos my own, except where noted otherwise.